Nigar has Guillain-Barre Syndrome, a rare and dangerous disorder in which the body’s immune system attacks the nerves. This spreads quickly and paralyses the whole body. 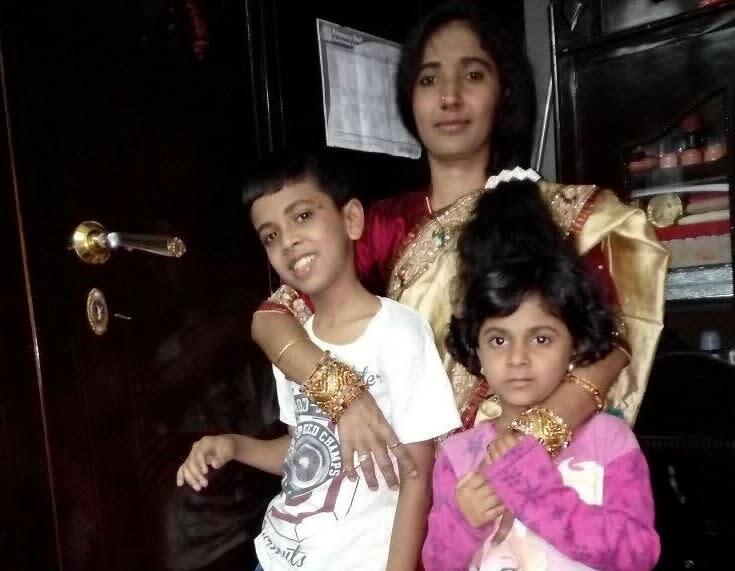 Nigar’s husband, Asghar, now shuttles between Bangalore and Channapatna, taking care of the children, the small farm that they own and visiting his wife. 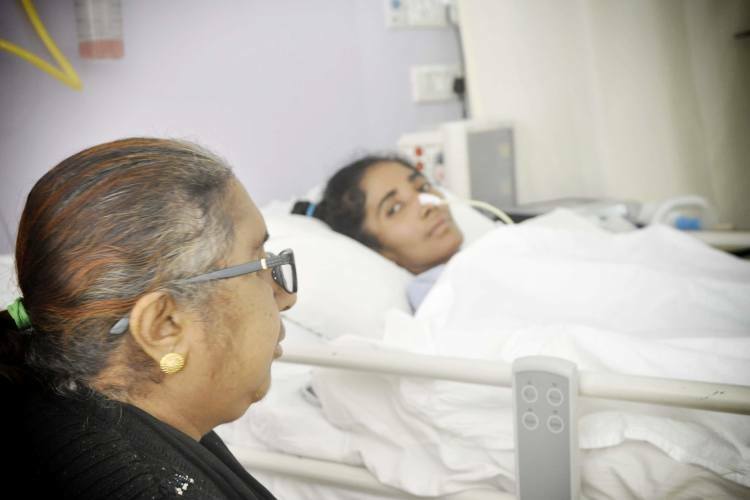 Nigar’s younger sister, Rahat, and her mother, Gulnaaz, stay with her in the hospital. With medication and physiotherapy, Nigar’s condition is slowly improving. 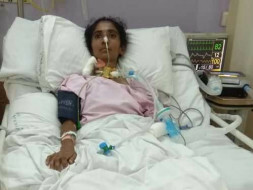 She has now slowly started moving her fingers and her neck, but she still has a long way to recover completely. Rehaan (12), Ariyan (10) and Ayan (7) are everything to Nigar. Even now in the hospital, her eyes light up every time she hears their voice or sees their picture. 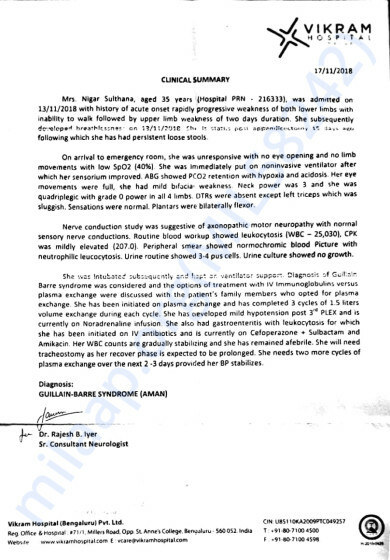 Nigar needs continued treated and physiotherapy to survive this dangerous disease. Her husband owns a small piece of land and earns just enough to take care of his family. Her sister works in a private company and has helped as much as she can so far. Her parents have also exhausted all their savings on her treatment. 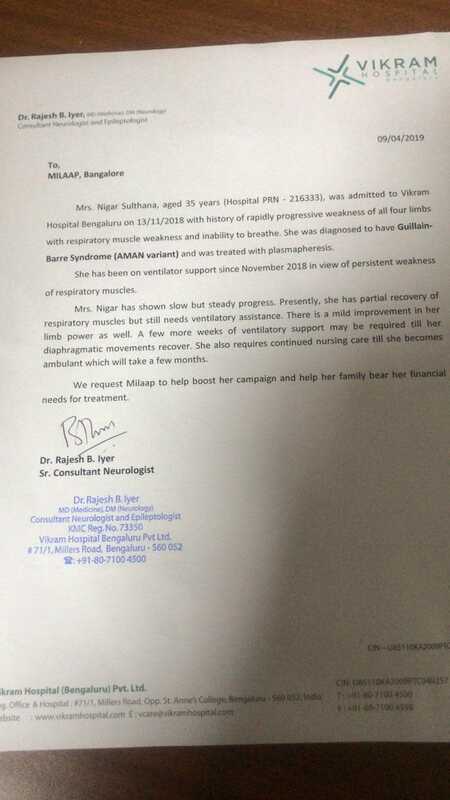 Together, they have spent 20 lakhs so far and were able to start her treatment, but now this family needs your help to save the kindhearted Nigar. She can go back to her children with your support. 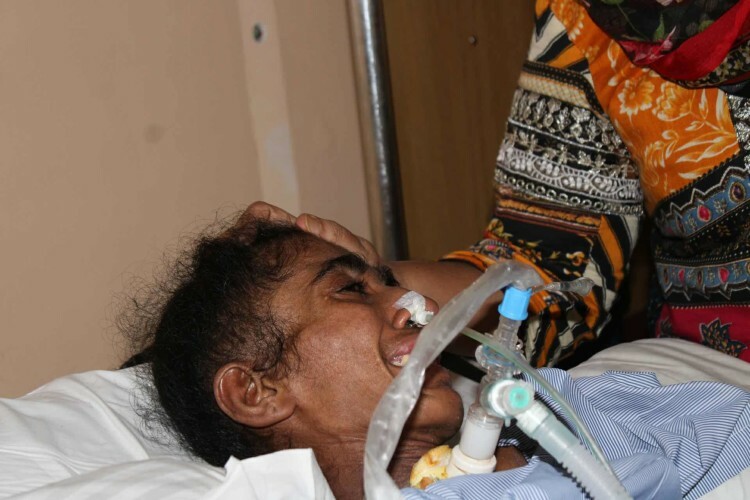 Your support will save this mother's life. Nigar is still in the hospital. 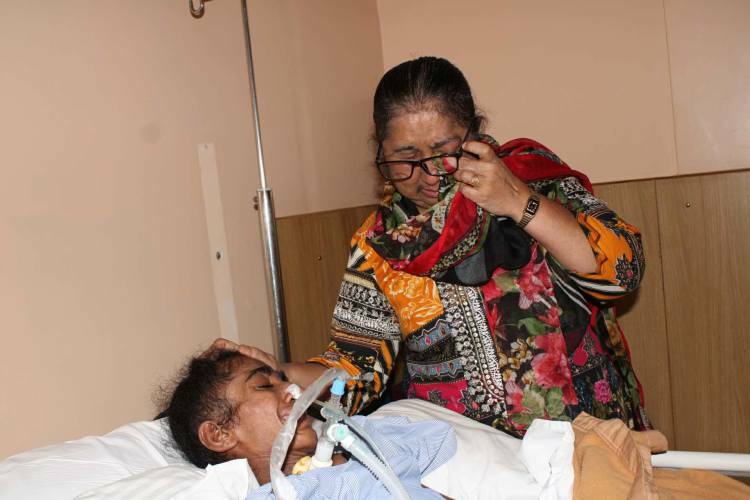 She is presently on ventilator and is advised to be on ventilator for few more week. 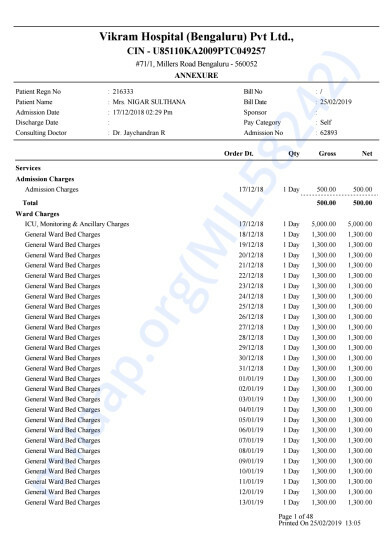 Hereby, we are attaching an update letter from the hospital. Please share this campaign with your friends and family and keep supporting her. 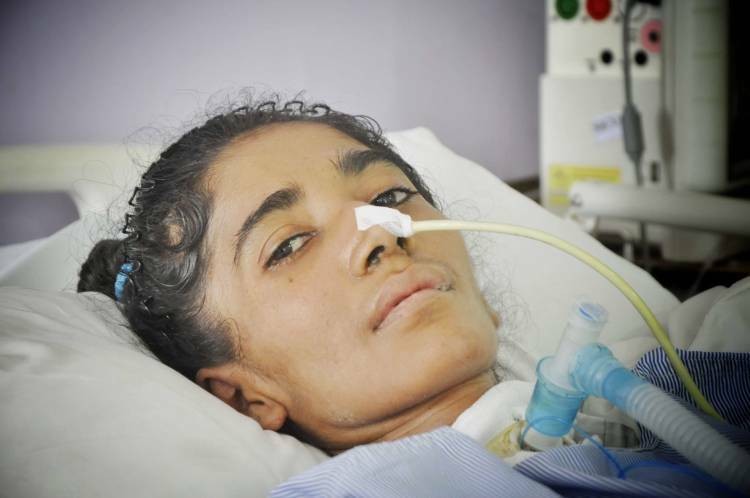 Nigar has shown progress with regards to her lung functioning. Her Diaphragm muscle is not functioning, doctors are waiting for it start functioning so that she can be out of Ventilator and breathe on her own. 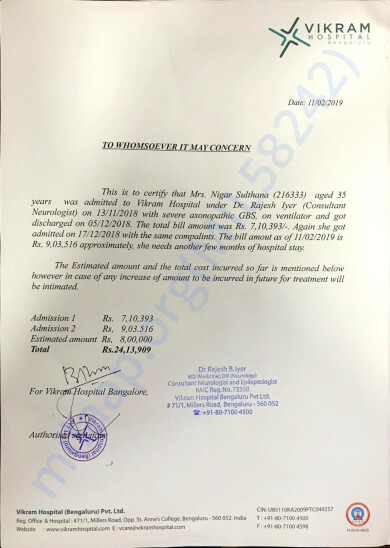 Nigar is suffering from Accute GBS which is expected to take longer for recovery as she was already a lean body with less muscle weight and low on immunity she is taking longer than usual. She is expected to recover her respiratory functioning in 6 month of which she has completed almost 5 months, one more month to go. Keep praying for her, and circulate her campaign with your associates and friends as we still need financial support from you. 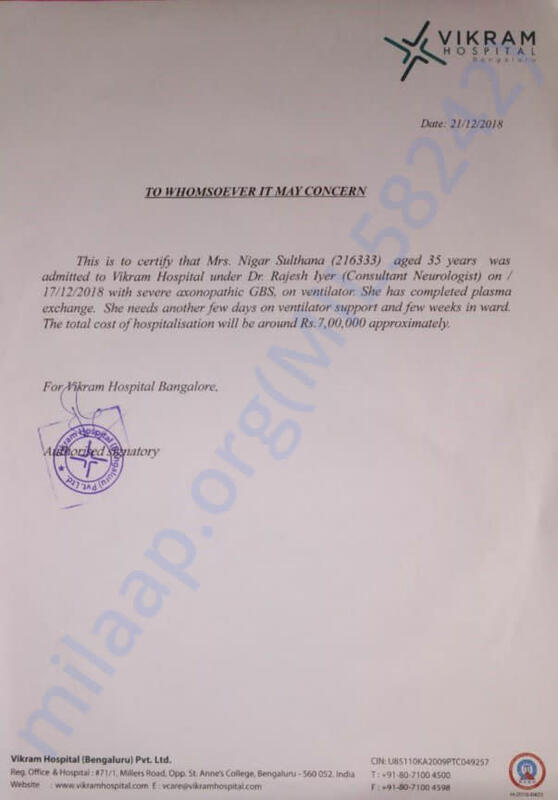 Mrs. Nigar is required to be in Hospital for few more month/months may be. 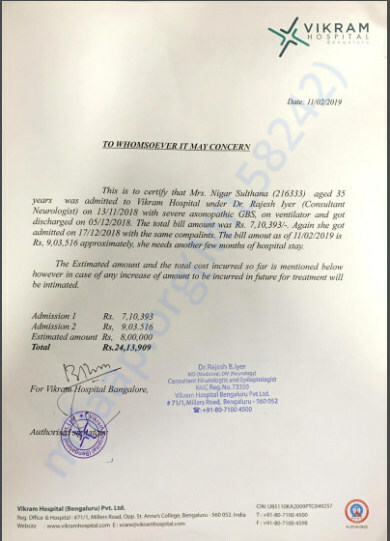 As per 13th November 2018, her whole body was paralyzed with acute severity which included her complete Lung Muscles, partial Cardiac and partial facial muscles. 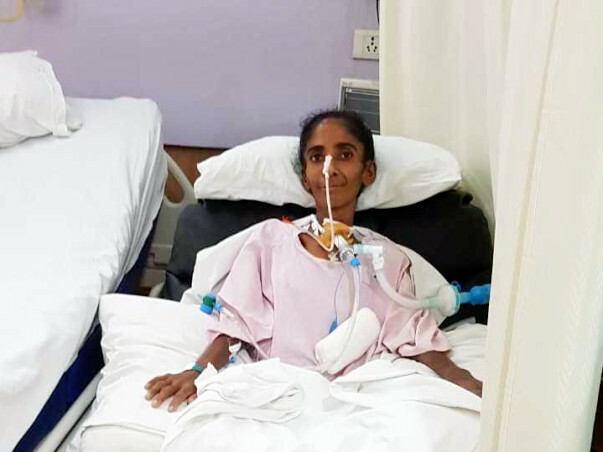 now that she has started recovering from her head and improved until her neck and shoulder, she would still have to recover her rest of the body which includes her Lung muscles and cardiac muscles. Her cardiac muscles fluctuates sometimes with high heart beating rate, but she is able to pull it off. 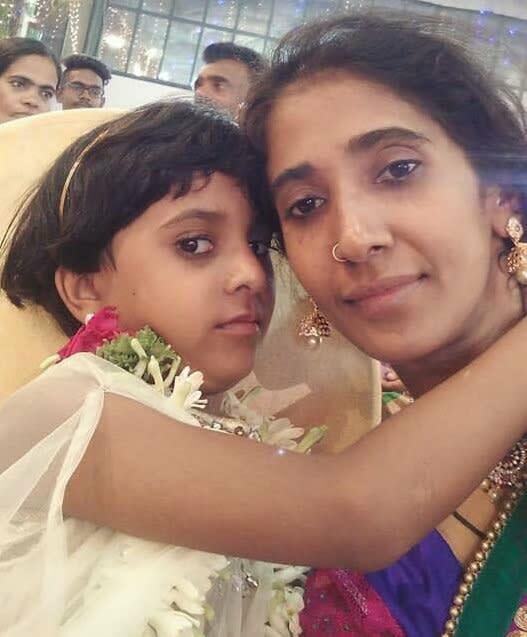 What is worrying a lot is her Ventilator Support which has taken 4 long months now, according to her Doctors, they cannot keep her on ventilator for more than 4 months, as it may lead to blocking of Tube and Infections. 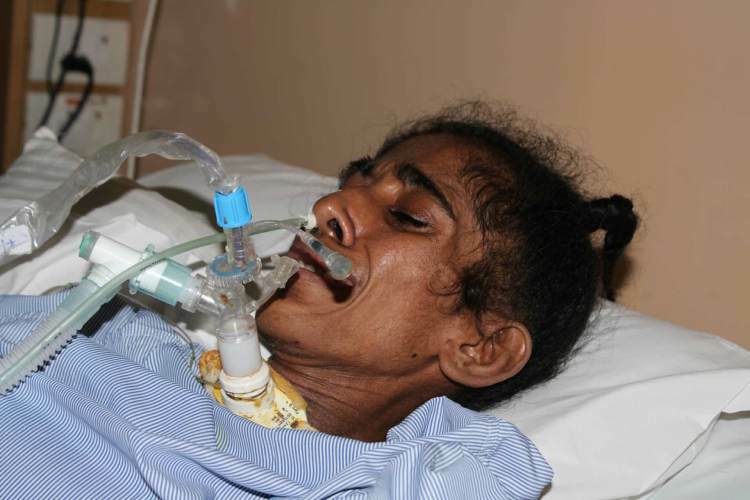 Family is only hoping for her to recover until her Lung muscles and she can breathe on her own.